Barre Center for Buddhist Studies (BCBS) is pleased to announce its publication of Older and Wiser: Classical Buddhist Teachings on Aging, Sickness, and Death, by Mu Soeng, Gloria Taraniya Ambrosia, and Andrew Olendzki. This book is intended as a practice guide for individuals and groups dedicated to practicing the teachings of the Buddha, and reflecting on the urgent issues of aging, sickness, and dying. Emerging from the curriculum for the Going Forth courses offered by BCBS, the book includes sections on: 1) A shift in focus: a time for retiring; 2) Equanimity; 3) Aging; 4) Illness; 5) Death and Dying; 6) Mourning; and 7) Practice. Each section contains four passages from the Pali Suttas, with commentaries from each of the three authors on each sutta selection. 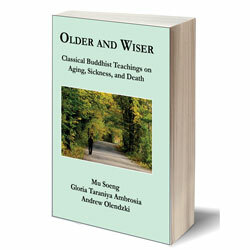 Older and Wiser presents a rich collection of material from the classical teachings of the Buddha and offers the unique perspectives of a scholar of Pali Buddhism; a lay Dhamma teacher trained in the Thai Forest tradition, and a scholar and practitioner in the Korean Zen tradition. The book also offers an extensive list of questions for group study on each of the 28 sutta selections which were developed to provide study groups with a basis for ongoing collective reflection. Two concluding essays help to re-frame the traditional Buddhist “Going Forth” paradigm for contemporary times. While the original meaning of the phrase had largely to do with going from home to homelessness, in our own times it stands equally well for lay people coming to terms with their practice during the retirement years, and while dealing with illness, infirmity and mortality. The book is available through the BCBS bookstore and from major online retailers such as Amazon, Barnes & Noble, and IndieBound.